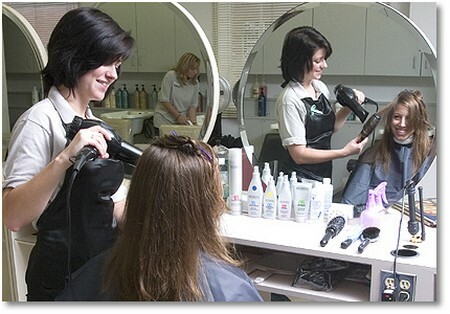 Cosmetology is the study and application of beauty treatment. People have been using cosmetics to improve their appearance, mimic animals or just to look scary for religious festivals since the last several thousand years. The history of cosmetology is actually older than civilization. Ancient nomadic peoples were known to have made up pastes of mud and ash that they applied to their bodies for disguise or to scare other tribes. It is easy to think of cosmetics as a product for women but cosmetology has probably been used by both genders throughout its history. The oldest use of makeup dates back to 4000BC from ancient Egypt. Nobility in ancient Egypt used combinations of lead, mercury, ash and other substances to create black eyeliner and was used to accentuate the shape of the eye. Priests and nobility like in ancient Egypt used deodorants like ground carob pellets which were rubbed directly on the skin. Egyptian hieroglyphics have provided wealthy information that helps us understand how cosmetics were used in ancient times. Chinese noble families used mixture of gelatin, gum, beeswax and some colors on their fingernails. The brighter colors were only worn by nobility as a mark of status. Commoners were forbidden from wearing nail polish that was too bright or colorful. The art of cosmetology had advanced during the Roman times considerably with the use of oil and lotions. Greasy lotions made from animal fat were often applied to the face and other parts of the body to hide imperfections. Roman cosmetic manufacturers were among the most prolific of the ancient world with female slaves known as cosmetae. Their preparations were known even in those times for being highly toxic yet vanity was a curse and an obligatory pass-time in Roman society. During the same period, advances in wigs and hair dyes allowed anyone with the means to alter their appearance almost immediately and in most cases very satisfactorily. There was special demand for Roman wig makers from aging senators and generals for whom public appearance was of paramount concern and where baldness was considered a sign of weakness with too many competitors being younger. Other parts of the world like India and the Middle East have been using “henna” ever as a decorative covering in often complex designs more reminiscent of a tattoo than modern ideas of makeup application. Arab chemists had developed a distillation process that made perfumed oils. They were also worthy among other products. Human vanity first used this process in scale for the pleasure of nobility and wealthy merchants who demanded sweet smelling bodies and clothes. The reformation period of Europe was one of the modern highlights of cosmetology. Eau to toilette also known as eau de cologne was invented which had the specialty of spraying rather than rubbing fragrances on the skin. Makeup was being used extensively by almost anyone by the time of the late reformation with goals of being accepted by their peers and the nobility. With whitening creams made from white lead in great demand as gentry vainly tried to convince each other they had never seen the light of day. With the advent of Hollywood movies and television in the 20th century, cosmetology has been taken to new heights with acceptance and availability as people of all ages and types try to emulate their favorite stars. The mass market for cosmetics has never faltered from that time and continues to grow as an industry with more and more nations becoming developed. The 20th century saw important developments in the introduction of skin coloring agents such as tanning solutions, chemical based skin lighteners and multiple colors of old faithful such as eye shadow, lipstick, blush or nail polish.